On Thursday 16th of November 2017, the Hydroville successfully completed her Sea trials and received the Certificate of Class from Lloyd’s Register . Hydroville is now the first passenger shuttle that has received a Class’ approval to burn diesel and hydrogen in its 2 combustion engines. On the same day, the Hydroville was delivered to CMB Technologies. In the meantime the Hydroville has arrived in Belgium and is on its way to the home port: Antwerp. In the coming weeks there will be an official christening and naming Ceremony and the Hydroville will be prepared to transport people from Kruibeke to Antwerp during rush hour to avoid traffic jams. At the same time it will also function as a demonstration and research platform for hydrogen and will travel to events in Europe. 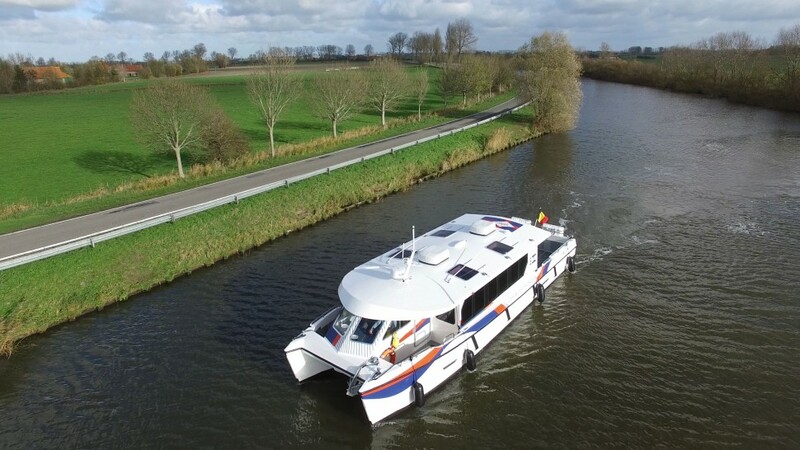 About Hydroville: Hydroville is the first certified passenger shuttle that uses dual fuel combustion engines that burn diesel and hydrogen to propel the vessel. Hydrogen has the advantage that no CO2, particulate matter or sulphur oxides are released when burning it. The shuttle will be mainly used as a platform to test hydrogentechnology for commercial sea going vessels. In a first phase the Hydroville will transport people from Kruibeke to Antwerp during the rush hour to avoid traffic jams.